b. What is the difference between abjad, abugida, and alphabet? ​a. Above is a spectrograph of the sound wave for "Good morning". How is an image like this important for our understanding of alphabetic writing systems? b. Sketch the essential differences between the approach and conclusions of Barry Powell and David Olson as they seek to describe and analyze how it was that the Greek alphabet came to be. a. Who is Sarpedon and how does he die? b. What is the immediate consequence to Agamemnon’s rejection of the ransom offered by Chryses? 1. Identify the context, that is, explain what is going on in this part of the tale, and from what part of the tale the passage is taken (for example, if you were given the lines below, you would want to identify this as Hera speaking to Zeus when he hesitates about whether to save his son Sarpedon, in the book in which Patroclus is the hero and dies [book 16]). the passage is significant in the context of the tale, and/or how the passage is more generally significant in terms of Homer's artistic aims and technique (for example, for the passage below, you would want to talk about the relationship between fate and the power of the Olympians, the fragility of the divine ORDER, and how that the divine hierarchy reflects the human hierarchy, equally fragile, in the world below). painful death a mortal man long ago doomed by fate? Do it! a. Who is Themistocles, and what is his character as depicted in Herodotus? b. Where is the Hellespont, and why is it so important in Herodotus? a. Describe how historiê in Herodotus differs from that in Thucydides, in terms of narrative strategy, creation of authority, and ultimate goals. Give specific examples for each characteristic delineated. 3. Stories. Tell the story and then indicate the significance of the story by citing at least two themes that the story exemplifies. These must be major themes in Herodotus. 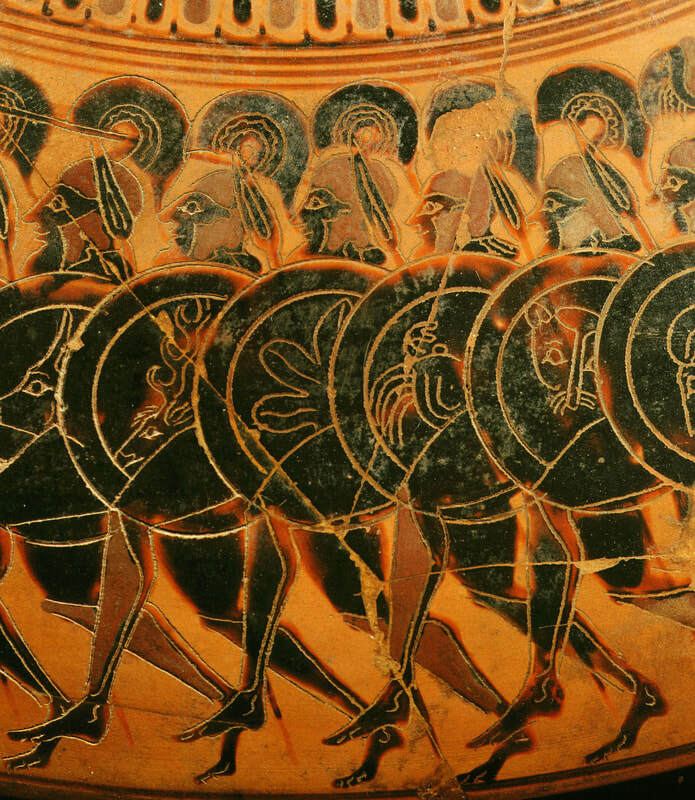 Pictured at top (close-up) and above: Hoplites running. Detail from black-figure Attic vase, 6th century BC. Naples, Museo Archeologico Nazionale.